This dish is so much fun to eat, especially when I'm craving pasta with a sauce and I don't want to eat too much starch. It's so aromatic and full of fall flavors. 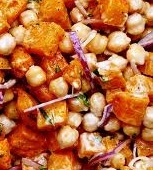 Makes for a great Mediterranean entree but if there are more people, it's a great side dish for meaty dishes. Plus, it's so easy to make! Place the squash on a cutting board. Using a large, very sharp knife, cut the squash in half lengthwise. Scoop out the seed with a spoon and discard. Place the squash halves on a roasting rack and season with 1/4 teaspoon each of the salt and pepper. Place 1 tablespoon of butter and 2 sage leaves in the hollowed -out core of each half. Bake the squash on the oven's middle rack until the flesh is just soft, about an hour (or longer, it all depends on your oven). Remove the squash and let it cool until you can work with the flesh comfortably, about 15 minutes. 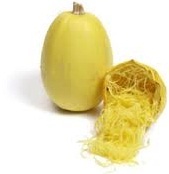 Using a fork, scrape the meat of the squash away from the skin, so that you get fluffy spaghetti-like strands. Reserve these and discard the skins. This can be made ahead of time, stored in an air-tight container in the fridge. Heat the remaining 3 tablespoons of butter in a large saucepan over medium heat. When the butter has melted, add the walnuts. Toast the nuts and allow the butter to bubble, about 1 minute. Add the sage leaves. When the leaves release their aroma and begin to crackle in the pan, add the squash and stir to coat it with the flavored butter. Cook for 2 minutes over medium heat until the squash is warm, stirring frequently so the flavors get inside the squash. Season with the rest of the salt and pepper, or to your taste. Serve on a large plate or platter, topped with the cheese. Another Mediterranean dish I love - I make it all summer long, and sometimes even in the winter! Makes 4 servings but can be doubled!! Peel the shrimp, or buy already peeled. Mince the garlic with the salt, mix it with the cayenne and paprika, then make it into a paste with the olive oil and lemon juice. Mix the sauce over the shrimp. Let the shrimp come to room temperature while you turn your grill on or use your broiler. Grill or broil the shrimp on each side for 2 to 3 minutes., serve immediately or at room temperature.